Morphological imaging is a versatile technique that combines particle size measurements — such as length and width — with particle shape assessments — such as circularity and convexity — to fully characterise both spherical and irregularly shaped particles. Manual microscopy, which can be time-consuming, subjective and potentially inaccurate, is progressively being replaced with more efficient automated imaging for many applications, including pharmaceuticals, energy storage, additive manufacturing, forensics, building materials, mining/minerals and spray drying to name a few. Automated imaging is now an established technique for gathering statistically relevant particle size and shape data, and when combined with Raman spectroscopy it also provides comprehensive chemical analysis. Morphologically-directed imaging using Raman spectroscopy enables characterisation through the collection of spectral data for particle populations of interest. The technique is particularly useful for the precise and reliable identification of particles within a blend that cannot be differentiated on the basis of size and shape alone. Sample spectra can be correlated with reference spectra to securely identify particles and gather data uniquely for them. The ability to isolate a particle population on the basis of particle size and shape allows the efficient direction of spectroscopy to those particles of interest, providing complete and time-efficient characterisation. 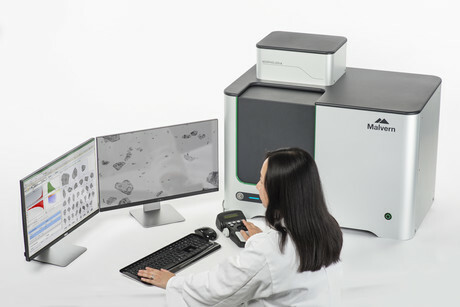 Built on the market-leading success of previous systems, the new Morphologi 4 automated static imaging system and Morphologi 4-ID, with integrated Morphologically-Directed Raman Spectroscopy (MDRS®), are powerful tools for every scientist seeking absolute analysis and understanding of their samples. The Morphologi 4 is a fully automated system for characterising particles ranging in size from less than one micron to over a millimetre. Sharp Edge analysis, a new automated segmentation algorithm, makes it easier to detect and define particles. The 18 MP camera and enclosure of the sample during imaging has led to higher measurement sensitivity. These advances make it possible to accurately measure light-sensitive and low-contrast samples, such as proteins and certain mineral and chemical species, and deliver enhanced shape parameter sensitivity for samples. The Morphologi 4-ID delivers Morphologically-Directed Raman Spectroscopy (MDRS), integrating the static imaging capabilities of the Morphologi 4 with Raman spectroscopy to enable the component-specific morphological characterisation of different chemical species in a mixture. The instrument is fully automated and is designed to allow both particle characterisation scientists with limited spectroscopy experience, and more experienced spectroscopists to gain an in-depth understanding of their particulate samples. Applications where the new Morphologi instruments add particular value include: characterisation of the Reference Listed Drug (RLD) during deformulation in generic pharmaceutical development; determination of the morphological profile of the Active Pharmaceutical Ingredient (API) during chemical development; chemical identification and morphological characterisation of formulation components during formulation development; batch-to-batch comparability; the identification of foreign particles and troubleshooting during manufacturing.